Get your FREE & steamy hot book right now! Her ex-boyfriend suddenly returns to the old neighborhood for a large show with his new band. He has finally gotten the big break most people never saw coming. The groupies are ready to devour him whole, his music is on every station, but something’s still missing and he aims to get it. 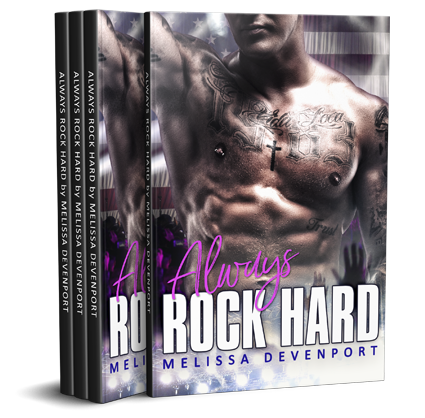 Always Rock Hard is a short and sweet introduction to the steamy hot romance universe that is Melissa Devenport. Much more is available and new books are published frequently. "I just couldn't put this box set down .... I haven't gotten much sleep in the last few days. Can't wait for her next new release." "WOW! "PERCY" is intense! Melissa Devenport offers a new novella today that will knock your socks off!" "Very creative and extremely intense read. Loved it from the first words to the last. Hated for it to end." "This whole series is phenomenal! It has all kinds of emotions you could ask for. I highly recommend this book." "Holy hotness this set was fantastic. I just loved every book in this set." "Great! It is hot, exciting, & adventurous. The two main characters have amazing chemistry and it's well written." HOT STUFF COMING YOUR WAY!